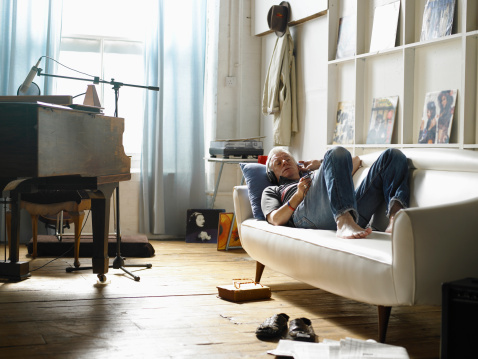 When your home lacks space, every inch of square footage counts. Which can make decorating a small living room — that's both functional and inviting — quite the challenge. So how do you make it look absolutely amazing, without feeling too cluttered or cramped? Enter IKEA. The affordably priced mega-retailer has long cornered the home decor market in terms of smart, stylish solutions for small spaces, offering products that are both practical and pretty. 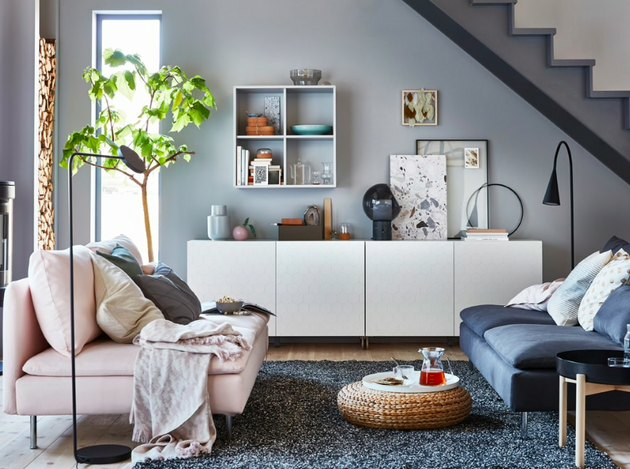 With the right space-saving furniture and decor, any living room — no matter how small — can be transformed into a relaxing retreat that perfectly suits your modern aesthetic. 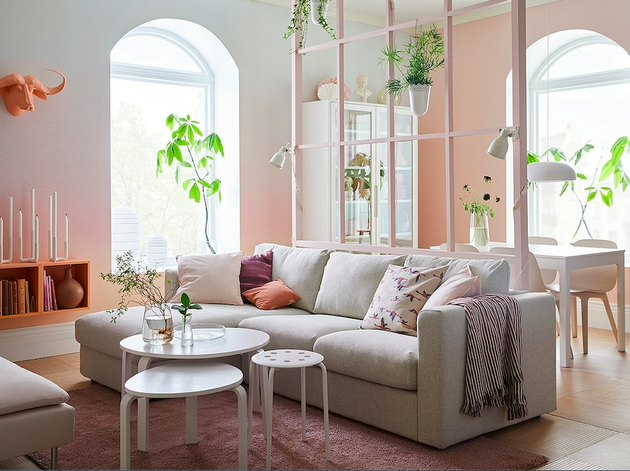 But don't just take our word for it, here are six brilliant IKEA living room ideas you should consider stealing. You'll be glad you did! 1. Pay attention to scale. Thinking about the scale of your furniture is just as important for the aesthetics of your living room as it is the functionality. Consider a smaller sofa that will leave space for an entertainment center, coffee table, and extra seating as well. And while you could opt for a larger sofa, and skip the extra seating, you risk it looking too big and overpowering in your small space. 2. Stick to the essentials to avoid unnecessary clutter. When you're lacking square footage, stick to the absolute essentials. 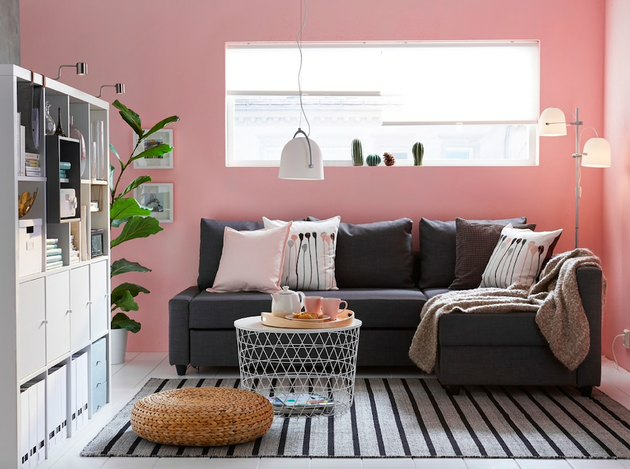 This IKEA living room idea will help you avoid feeling claustrophobic and keep your digs from looking like a hot mess. All you really need to create a relaxing atmosphere is a comfy sofa and a simple coffee table, as shown in this black den. And to keep your space from looking too bare, warm it up with decorative pillows, wall art, plants, and rugs. 3. Make use of accent pieces that serve double-duty. Opt for furniture pieces that pull double-duty as extra storage. For example, in this IKEA living room idea a wire-frame coffee table not only looks great, but is used to corral a stack of magazines, too. And this bookcase is far from average, as you can add doors, drawers, and bins to conceal your clutter while still creating all of the Insta-worthy shelfies you want. 4. Divide living spaces with screens that won't block the view. When you live in a studio apartment, or have an open floor plan that flows from one space right into another, figuring out how to clearly define your living room can be tricky. However, one of the best ways to divvy up space — without making your small digs feel even more cramped — is to install a transparent partition like this one, which also makes a great home for your plants. And don't even get us started on those ombré walls! 5. Make your ceiling height feel higher with low-profile furniture. 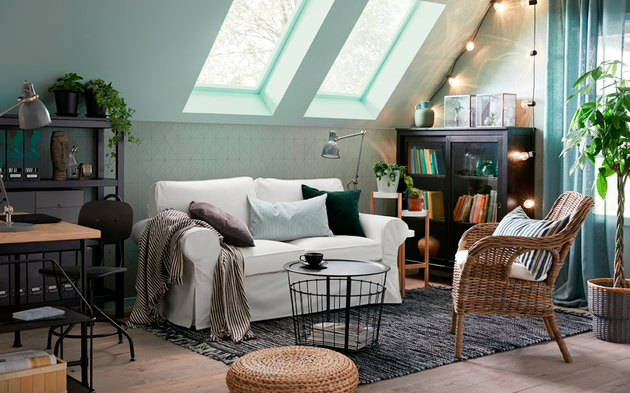 When it comes to choosing the best furniture and accents for a small space, take a cue from this blue-hued IKEA living room idea. Choosing low-profile furniture, like modern sofas, sleek floor lamps, and coffee tables, will make the ceiling height in your home feel higher than it really is. And who doesn't want that? 6. Think outside of the coffee table box. Here's an easy way to save space in a small living room: Think outside of the box ... the traditional coffee table box, that is. Opt for something smaller like this little side table, instead. It's just the right size for a tiny living space. Plus, since it's so lightweight, you can easily move it around as needed. You could also consider using a faux sheepskin rug and a few throw pillows rather than a bulky lounge chair to provide extra seating when guests come over.